It’s Walking Dead week, with the 2nd season bluray release coming this Tuesday. So for a limited time only pick up the 1st season of the hit zombie show on bluray for 61% off. You can choose from the standard edition or the special edition. There are a bunch of extras that are worth watching too. Season 3 starts mid-October, so get ready for some good zombie munching action. Take advantage of the cheap bluray prices, because they won’t last long. 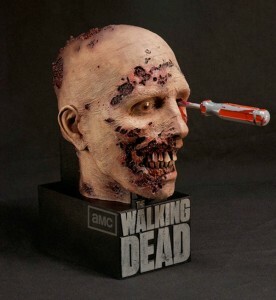 Check Out This AWESOME ‘Walking Dead: Season 3’ Blu-Ray Set!!! This entry was posted on Sunday, August 26th, 2012 at 10:09 am	and is filed under News, Television. You can follow any responses to this entry through the RSS 2.0 feed. You can skip to the end and leave a response. Pinging is currently not allowed. « Bryan Chats with Stephen Chiodo and Talks Everything ‘Killer Klowns From Outerspace’!! !